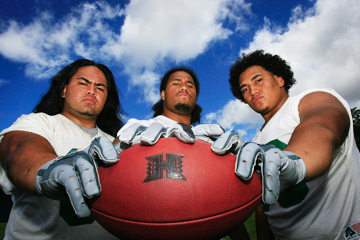 Converted running backs Jason Laumoli, Reagan Mauia and Siave Seti provide size and power to the Hawaii offense. Three former linemen are fitting into their roles as running backs quite nicely for the Hawaii football team. The new label, though, still doesn't feel quite right. "I'm more like a fullback," said 285-pound senior Reagan Mauia. "A running back is shifty like Nasty (Nate Ilaoa), and all those guys with speed. You're not going to find that with me, man. It's straight ahead." While the Warriors' running game this season will feature the talents of the elusive Ilaoa, the Warriors have added depth and heft to the position by converting linemen into blocking backs. Mauia began last season in the rotation at defensive tackle, getting a start at Michigan State, but ended the year by rushing for 56 yards and a touchdown against San Diego State. Siave Seti was moved to running back in the spring, and junior college transfer Jason Laumoli made the switch just last week. "The attitude on defense is you've got to bring it every day, you've got to hit hard," Seti said. "On the offensive side, when we're blocking we're always aggressive, so I think you can bring your defensive skills to the offensive side." The burly backs occasionally get a chance to carry the ball on draw plays or catching swing and shovel passes out of the backfield. But they know their primary duty is to provide another level of security for the UH quarterbacks as an extension of the offensive line. "Blocking is very vital to what we do, and big guys can make yards in our running game," UH coach June Jones said. "A running back's first job is blocking." "They've bought into the part," running backs coach Wes Suan said. "They're definitely working on their running back skills and they're conscientious about it. There's still a lot of taught skills that are involved, but the attitude and the effort are really solid." With the move, Mauia and Seti are sporting smaller numbers on their jerseys and on the scale than last year. Mauia, who traded his No. 92 for 34 this season, weighed in at more than 350 pounds last season and is down to 285 this season. Seti (No. 39) redshirted last fall and returned for the spring semester in January at 320. He trimmed down to 280 by following what he calls "the Reagan diet." "Just protein, chicken, meat," Seti said. "No sugar, no soft drinks, not even Gatorade, just water, and it really helps out. I feel like I can move better and I'm more mobile." Along with changing his eating habits, Mauia worked out with his old junior college team in California over the summer to shed the pounds. "I had to discipline myself," Mauia said. "It was hard trying to get out to the track, but it's the discipline that gets you to get out there. Just did a lot of running, a lot of weight-room work." "Reagan is used to carrying a 380-pound body. His leg strength is good and he's able to move around real well," Suan said. The converted linemen aren't alone among Warrior running backs who started out playing other positions. Ilaoa began his UH career as a receiver and Khevin Peoples moved over from linebacker last week. David Farmer proved a quick study last season and returns after rushing for 49 yards and a touchdown as a freshman. For players accustomed to the close combat of the interior line, the move brings a welcome change of perspective. "I'm so used to seeing the quarterback and the running back and you just want to eat them up," Mauia said. "Now being in the backfield, now you're staring out at linebackers, D-line, safeties, and just waiting to eat them up." And their backgrounds on defense have come in handy in learning the blocking assignments. "We're good at recognizing defenses because we used to play defense," Seti said. "For instance, if a defensive lineman is lined up next to another, we know it's going to be a stunt. We're able to pick up things like that and bring it to the offensive side of the ball." Laumoli (5-10, 264) is actually playing his third position with the Warriors. He was a defensive lineman in the spring, and moved to offensive line this summer. When the scout team was short a running back during a practice last week, he was quick to volunteer and the coaches stuck with the switch. "I'm still in the learning process. Coach Suan and everybody are still helping me and I keep asking questions," Laumoli said. "When I play fullback I'm going head up with anybody I see with a different jersey. Offensive line is hard because it's big guys going against other big guys. In the backfield, I'm taking on linebackers." Shifting players into the backfield is nothing new for Jones, dating back to his early years as a coach with the Houston Gamblers. "Over the years we've had a lot of players become running backs," Jones said. "We've always been able to identify them. Way back in the USFL days, Todd Fowler never played running back before in his life and rushed for over 1,500 yards." When the backs do get the ball, their running style is decidedly more bash than dash. But their agility did factor into the decision to make the moves. "It's almost an oxymoron, big guys who are light on their feet," Suan said. "But they do have good feet." And though relatively new to the position, the backs already feel at home in the backfield. "It's a good bond that we have, the skinny guys and the big guys," Seti said. "I love being with the running backs."